Meticulously crafted and ultra-thin, Surface Book is the ultimate device for powering your ideas. Its 13.5-inch PixelSense display rivals the printed page with a resolution of 3000 x 2000, and features an integrated backlit keyboard, optional graphics, and responsive glass trackpad. Go beyond the laptop and detach the screen to use like a clipboard, or rotate and reattach to use like a canvas. It weighs just 3.34 pounds and has a battery life of 12 hours5 for all-day use. Enclose the Microsoft Pro tablet today with a state of the art enclosure. 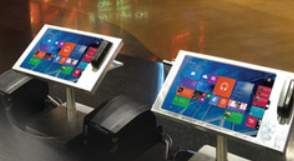 Combine a Mag tech credit card reader, Microsoft Pro tablet, and an nCLOSE enclosure to create your new point of sale transaction.